Blog tour update: Next week you'll be seeing a guest post by me on Hobbies On a Budget. This week they'll be opening up a giveaway for a copy of my book in conjuction with Sharon's review of it. Please go check it out. Coming soon: A guest post on traveling London on a budget on a new blog called The Travel Guru. And I've been picked up as a regular weekly contributor on FareCompare! Here's my latest. Ah, the Bahamas. They sound so tropical. So exotic. So…Expensive. It’s true. Many places can be, but you can pretty much find affordable things to see and do everywhere you go if you know where to look. Lucky for you, I have come up with 10 (actually 14) things that you can do that are fun, educational and won’t break the bank. I really had no expectations of what Nassau would be like, but aside from the obvious poverty, the city was colorful and the people were so lovely and welcoming. 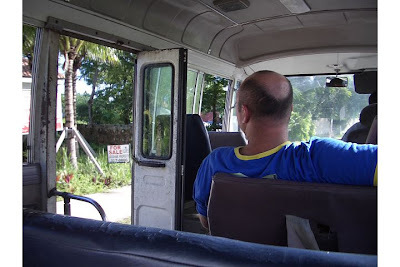 Where else can you meet a homeless man who can tell you the whole history of the island in 10 minutes and then chat to you about your favorite basketball team (that would be the Portland Trailblazers)? Okay, possibly that is more common that I think, but if so, this is the first and last time I have encountered it. Zoo – Ardastra Zoo is a little bit off the beaten path and probably unlike any other zoo you’ve ever been to. 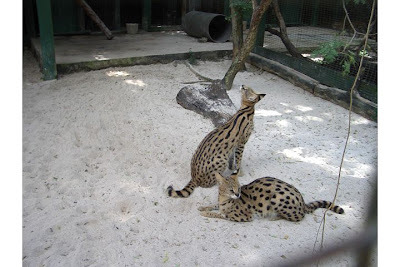 The dangerous animals in cages don’t have a barrier to keep you from getting up close and personal with them. Some animals aren’t even in cages and roam freely. 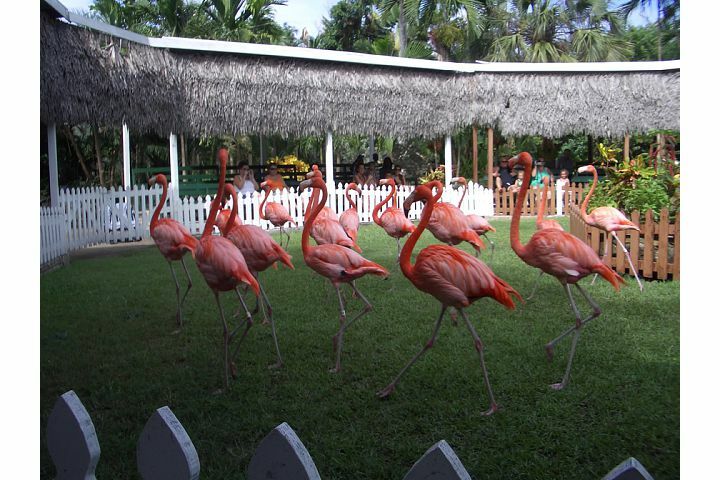 You can also see a stand (flock) of flamingos demonstrate how they can be trained and respond to commands. And again with my love of the lorikeets. For just a few dollars you can go in and feed them unlimited amounts of apple slices – which is much better than fruit juice, because you don’t end up with half the juice down your arm and 9 birds trying to stand on one tiny cup. The admission fee is a little steep, but you can spend a good part of your day here. Remember to follow the signs and just walk the few blocks from the main road to get to the zoo. You’ll end up going through a neighborhood, but it’s free. We snickered as we saw some tourists drive by in a cab. They were obviously too afraid to take the bus or walk. At least they left their resort though, so I'll give them that. If you have some extra time and they’re open, you might try stopping into the botanical gardens. They are right on the way to the zoo from the main road and only $1! Versailles Gardens – This is probably one of the coolest things you will see anywhere, well, probably garden-wise and outside of Versailles. It’s a short walk from the Atlantis, which is a somewhat longer walk from downtown Nassau (even though it didn’t look that far on the map). 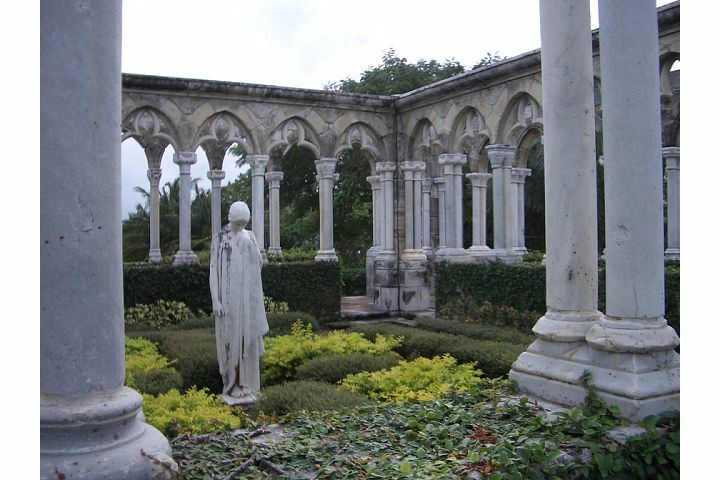 The gardens are beautiful and make a nice romantic backdrop, since it’s also very private. All of the statues that live in the gardens were shipped from France, as well as The Cloisters, the remains of a 14th century monastery, which is set in its own plot of land. Originally purchased by William Randolph Hearst, it was purchased and finally pieced together by Huntington Hartford, the (then) owner of what is now known as Paradise Island. Explore the Straw Market – While most of the market stalls have the same things (fake Coach bags, fake Louis Vuitton wallets, fake Kate Spade bags, fake Raybans, etc.,) you will find some interesting handmade merchandise here and at very good prices. You can practice your haggling and also take home some fun souvenirs. Hold on to your wallets though, because 9 vendors will start yelling at you at once telling you that they have what you want. They probably don’t. If you can’t say no, this probably is a bad place to go, or just leave your wallet with someone else (preferably trustworthy) in your party. My husband came back with a selection of wallets and I ended up with two faux Coach purses and some shell necklaces. So not what we needed to go home with. 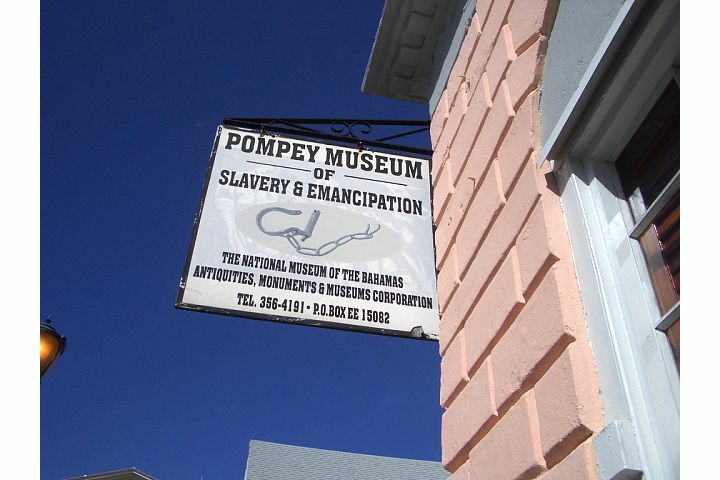 Visit the Slave Museum – Located right next to the entrance to the Straw Market you will find the Pompey Museum of Slavery and Emancipation. I always like to check out the local history of a place. Not only was this the story of the Bahamians, but also of slaves in America. You aren’t allowed any pictures inside the museum, but if I could have taken them, all of what you would see would be really depressing. 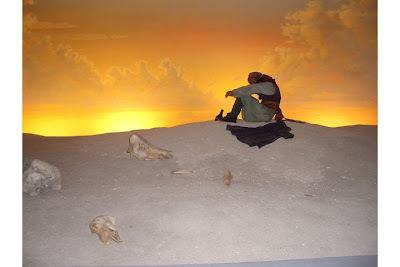 The museum is pretty interesting, for the subject matter. I learned a lot that I didn’t know and probably wouldn’t have wanted to know about how slavery worked and what they had to endure. Personally, I think they should charge more for entry fees for all they have there (original documents, photos, shackles and other artifacts), but at just $1 per person, it’s quite a budget education. A lot of reading is involved, but the museum itself is small, so there won’t be much walking. 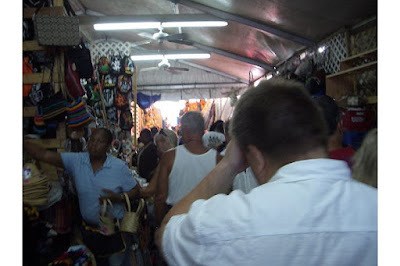 There is even a cute little gift shop at the end to purchase books, handmade goods and local Bahamian treats. 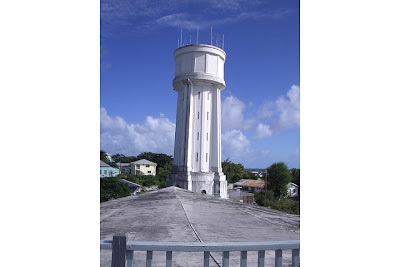 Hike up to Queen’s Staircase and Water Tower – Unfortunately, I did not run all the way to the Queen’s Staircase and so I never made it to this gem. You can go to the top for free and see amazing views. 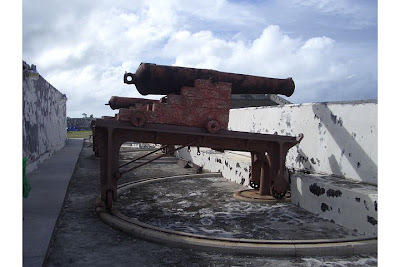 We didn’t realize there were three separate forts in Nassau until too late and then couldn’t figure out how to get to the one this is closest to. According to TripAdvisor travelers, we could have easily just followed the signs from downtown. Ah well! It’s not the first time we have been bad at maps. Pretend to defend the island – As mentioned above, there are three forts on Nassau. We made it to two and they also offer amazing views at free or cheap rates. We actually got to one right at closing, but the guard let us in for free to roam the grounds and take some pictures. Budget! I would go earlier next time though, so you could do an actual tour and learn more of the history and how they were used. You can still see all the original tanks and most of the walls still stand. Watch a game of cricket – Why isn’t cricket more popular than baseball? Like, why don’t we play it in America and televise it for the world to see? Unfortunately, when we visited, there were no games going, but you can watch a live game on a cricket pitch right in the middle of Nassau. At the Cricket Club Restaurant and Pub, you can have a meal and sit on the balcony and watch cricket on the weekends or just admire the ocean. Of course, if cricket isn’t on the menu, you can always watch other sports on their many TVs. Enjoy both British and Bahamian fare here with a full English breakfast or guava duff. Loved this place. Sit out on the balcony and listen to live music. Eat out – Despite what people told me, I found the price of food in Nassau to be extremely affordable. Of course, we also ate at local joints and hole in the wall places most tourists wouldn’t even think of entering. Bahamians love fish and they also love to fry fish. So, unless that fish was no good to begin with, you’re going to be pretty safe with any choice you make. You simply cannot go to the Bahamas and not order a batch (or 12) of conch fritters. It’s pronounce conk and it looks like a giant snail, but don’t think about that when you eat them, because they are delicious. If you love ceviche, then try it with conch. Eric swooned. 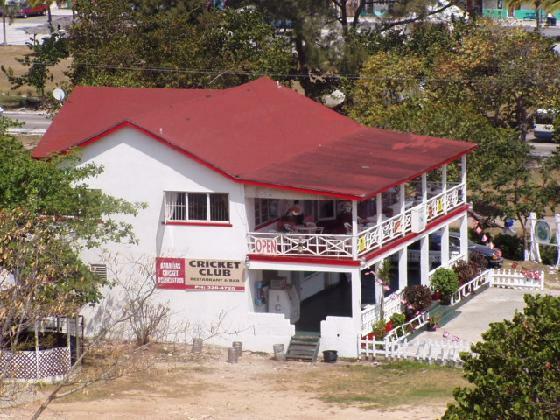 One place not to miss when dining out is Café Johnny Canoe’s. 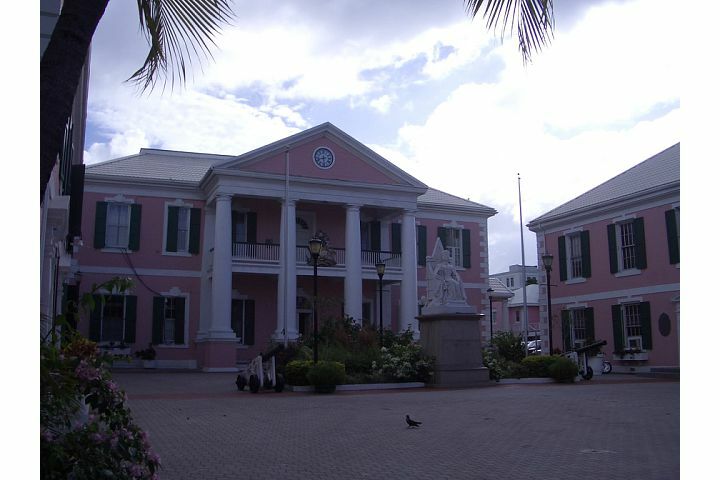 It’s a landmark, affordable and on weekend evenings you can experience karaoke and Junkanoo! I read that since my last trip they closed, but were looking for a new location, so if they have, make a point to drop in at least once. We were only there a week and ate there twice. 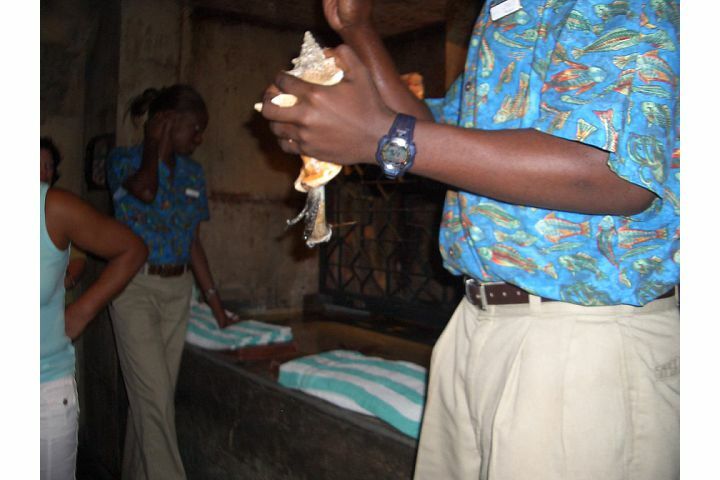 That's a conch there. Kinda like a snail...or mussel. 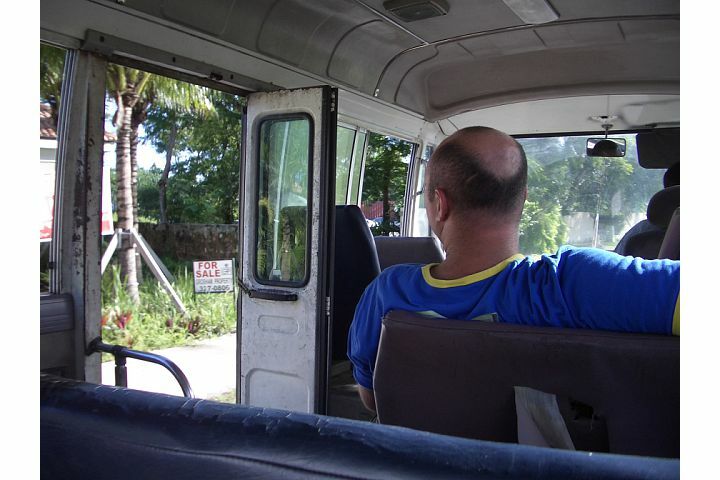 So, don’t think that the Bahamas are too rich for your blood. 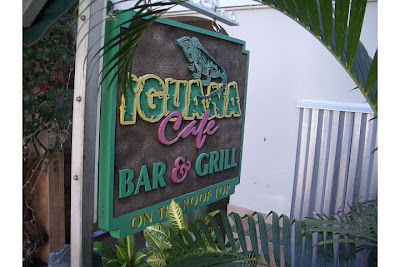 Nassau was a wonderful vacation destination and, if you stay away from tourist trap restaurants like Señor Frogs, it can be fairly easy on your wallet. Save that money to bring home amazing handcrafted ceramics and linens from their more upscale boutiques to make your home Bahama chic! Or just waste it on conch fritters and rum cakes or expanding your pirate wardrobe. It’s your vacation afterall. This book is fantastic for anyone interested in the world of traveling smart and saving money while not compromising your trip. I was quite impressed with how much information was in this book. There were so many tips on making a trip away from home more convenient, more entertaining, along with endless ways to cut expenses without lowering your expectations. She easily explains how to navigate sites on the internet to find exactly what you need. Everything from where to shop for things you will need, how to organize well in advance so you will get the best deals, to putting together a travel package to meet your own personal needs. Towards the end, she even details what the average person spends on a trip compared to what you can expect to spend by following her tips. Not only can you expect to save approximately half the money, but she finds ways to pack more vacation in for your buck. At the back of the book is an entire section devoted completely to references of websites, highlighting the ones she has found to be the most helpful. She always has a blog and a website with the same name as the book, which can be used as a companion to the book. But I found the resources in this book to be so thorough that it can definitely stand alone. Whether your are traveling abroad, or just taking a weekend get away, this book should be your most important accessory. Thanks so much for the great review Julie!